John Lynch, Kyle Shanahan and the rest of the San Francisco 49ers brain trust earned a stockpile of credibility last season thanks to savvy draft moves and the Jimmy Garoppolo (85.2 overall grade – 10th) trade that put the franchise’s move back to relevance into hyperdrive. As a result, they enter this season with a clear intent to compete in perhaps the NFL’s toughest division. As the math clearly illustrates, the two most important contributors to winning football games in the current NFL landscape are passing and coverage. With the quarterback locked in and ready to deliver the Niners from their sins of the past, the focus turned to keeping the savior safe and bolstering a coverage unit that ranked 29th in opponent adjusted PFF coverage grade. While many fans yelled into the Twitter abyss for an early-round edge rusher, the 49ers brass elected to not overspend in a weak edge class. Great coverage requires more players and this investment, especially considering the current slate of the 49er defensive line that mired through Arik Armstead’s (78.9 – 44th) injury and Solomon Thomas’ (53.2 – 92nd) rookie growing pains to rank 15th in opponent adjusted PFF pass-rush grade. This extended to the linebacker position where the question marks surrounding Reuben Foster (90.7 – 4th) increased the number of positions at which the Niners need to solidify their coverage capability. For even more information on who the 49ers drafted and possibly some undrafted free agent players who could make the team, grab a copy of our 2018 NFL Draft Guide with expanded profiles, scouting reports, PFF signature stats and extensive details on over 300 players you cannot find anywhere else. The 49ers first-round pick, No. 9 overall, should have been a tough decision for Lynch considering the number of talented options left on the board. In need of defensive backs with versatility, they had the opportunity to pick Derwin James (92.1) who ranked fifth overall on the PFF Big Board, 10 spots ahead of Mike McGlinchey (90.6). James was PFF’s top graded safety in 2015 and 2017 and has the ability to play safety, cover all receiver positions and blitz with great efficacy, he earned a 90.6 grade in coverage in his last season at Florida State. 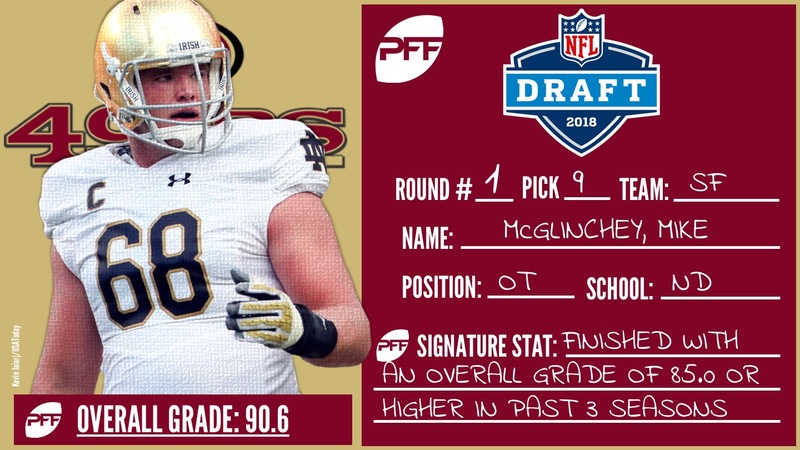 Passing on James, Lynch instead decided to invest in the long-term success of his quarterback and took the man best prepared to protect the 49ers most-prized possession in McGlinchey.